(January 30, Colombo, Sri Lanka Guardian) Yohan Perera of Daily Mirror reported last week “The Democratic People’s Front, led by Mano Ganesan, the New Left Front led by Dr. Vickramabahu Karunaratne, the United Workers’ Front led by S. Sathasivam and the Up Country People’s Front (UPF) have decided to form an alliance to contest several local bodies in the Badulla, Nuwara Eliya and Kandy Districts at the upcoming local government elections. DPF General Secretary Dr. A. N. Kumarguruparan told Daily Mirror that the DPF had formed this alliance with these parties to contest the elections. He said they would contest under the fish symbol. The DPF is also slated to contest other local bodies under its own symbol according to him. New Left Front leader Vickramabahu Karunaratne said his party had also formed a separate alliance with the Tamil National Liberation Alliance (TNLA) to contest the elections in the North. Dr. Karunaratne said his party has also made a no contest pact with United Socialist Party led by Siritunga Jayasuriya in some local bodies.” Though it is not the whole story I was glad to see this news item. I have mentioned in this column, the birth of a social democratic political tendency in the last period. 17-2However nobody paid much attention to this alteration in the Lankan political landscape. Naturally, the bourgeoisie society will be interested in a political tendency, only when it becomes a challenge to the existing political order. I cannot say that immediately we are going to make a serious dent in the local political picture. However, for the first time in the recent past, parties have broken away from existing bourgeois political camps, to take an independent stand. It was usual for one to jump from one capitalist camp to the other, but it was rare for one to take an independent political position. This time some thing happened. Not that we have a great understanding to go forward with a fascinating programme. No certainly not; but we came to an understanding to stick together for the downtrodden people, oppressed by the Mahinda regime. We used to campaign together against one or the other oppression or injustice, for a long period; may be a decade or more. We came together to have press conferences, meetings, pickets and street demonstrations. We supported strikes, opposed arrest and abductions, condemned brutal violence of the oppressors. However when it came to elections, we could not hold together and present a common policy to the people. In the end, some joined the bourgeoisie opposition while others contested independently to make the people aware. After each election we got together again for action. In that manner our alliance has continued. Mano, Siri, Sivaji, Mahinda Devage, Abu, Lakthilaka, Gajendra, Kelly and several others were with us in the struggles we launched. All our agitations took the form of pressure actions devoid of a common political direction. Hence the benefit of our work went to the oppositional bourgeois party. Today the oppositional UNP is getting converted to become a loyal party following the policies of president Mahinda. Premadasa is not a replacement for Mahinda but refreshment, just a new edition. This situation has become so obvious that many who hoped that UNP could become a democratic alternative, had to take a firm decision to follow a new political path in the coming period. We may not achieve much; but most certainly we are contesting through out the country. Of course we do not have a single symbol. We could not come to that level of agreement, in time. But we have avoided clashes and kept the unity of our purpose. One thing is we are against the policies of Mahinda that give enormous suffering to the working masses. Proletarians, as well as plebeians of villages find it intolerable; particularly, when the rich are given so much of additional benefits. Secondly, we are against the chauvinist policies of the government. Not only that the war destroyed well over hundred thousand people and destroyed the Vanni civilization, but also the plunder is continuing under military hegemony. State terror is present even in the south. Thirdly, we do not want any global power to push us around as they please. Indian rulers too, behave exactly like other imperialist powers. They helped all reactionary policies of the government. In fact they are the foremost defenders of this government. Finally we all want a solution to the Tamil national problem that goes beyond the limitations of the 13th amendment. This government has to be defeated, and the dictatorial constitution should be over thrown. We have to do some thing quickly to save the oppressed hungry people. JVP is tied down with its chauvinist policies. 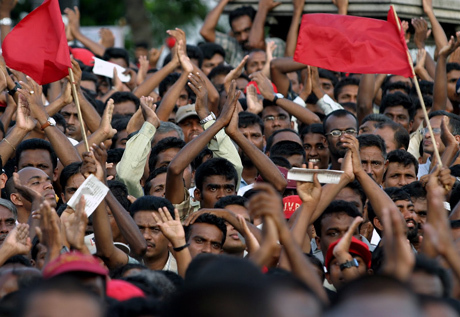 In spite of clear oppression guided by the emergency rule and the Prevention of Terrorism Act, the JVP was unable to vote against the extension of emergency. They are unable to detach from the chauvinist Sinhala state. How could they, when they were the most vociferous defenders of the Sinhala chauvinist bourgeois state. ‘“blessings of Buddha to the Sinhala chauvinist state even if it crushes us to pieces.” This was the foremost slogan of the JVP. Thus the social democratic alliance will be the only choice left for the people to select.